Kivy is an interesting project that allows you build GUI applications for different platform including iOS and Android. If you believe the rumors... I decided to check out is Kivy suits to build for small python GUI app for 5 major platforms: Mac OS X, Linux, Windows, iOS, and Android. In this series I'll try to build a small app for learning foreign language vocabulary and deploy it on all these platforms. This series woun't be a tutorial. It'll be more like a log of my tries and failures. I'll cover very basic things. No street magic. If everything goes as I expect, at the end I'll get 3 or 4 executables. NB: I use primary Mac for development. That's why most instruction will be for that platform. May be later I'll add instructions for Linux and Windows. There are two ways to set up Kivy on Mac. You can download and setup bundle from homebrew. Or you can install Kivy from PyPi. This approach has a disadvantage. Kivy.app contains only one virtualenv for all projects. It's OK for small, simple projects, but it can cause problems for big ones. That's why I suppose to install framework in a separate environment for each project. I assume that you use pyenv and pyenv-virtualenv. As soon as we get python installed, make virtualenv for our project. If a window with title "WordConstructor" appeared, everything works OK.
Let's set up PyCharm project. In the Preferences dialog, choose Project interpreter corresponds our virtualenv. Kivy uses Kv Design Language to describe UI. It would be nice to have syntax highlight and autocomplit for it. 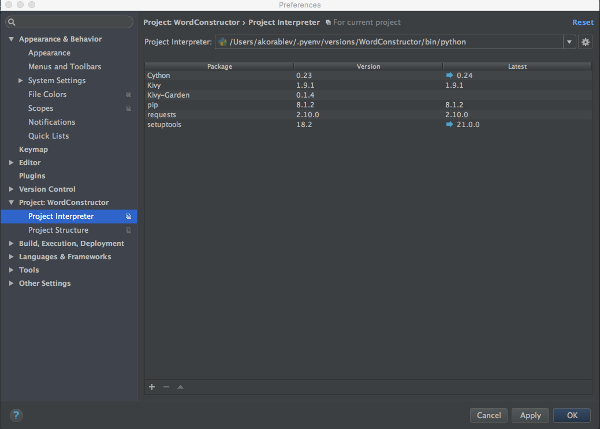 Import it in menu File -> Import Settings in PyCharm. Check File types on and press OK.
That's all about setting up the environment for Kivy. Second part will cover more practical topics. Please Do Not Use "else"